It may look like football. But no, Ryan and Riley are playing hockey on the beach. Trust me. The biggest challenge between our family and a successful vacation is keeping Ryan occupied. We bring along enough comforts of home — laptop, Hockey Guys — for him to keep a sense of routine, but we also don’t want him spending an entire vacation engaged in these solitary activities. So we limit his time with them to mornings, a bit at lunch, and evenings. The rest of the day is spent together at the beach or pool. Returning to the same vacation spot from a year ago — a condo in the Outer Banks of North Carolina — provided a clean viewpoint from which to evaluate his progress. Well, “avoided” is probably a bit strong; those statements and questions still came. But their frequency was lessened. More importantly, while we were outside, it was easier to engage him in various games and activities, many of which he came up with on his own. Whereas a year ago, he spent much of his pool time alone in the giant hot tub at the complex, this year he spent most of it playing in the main pool. Sometimes alone, often with Veronica or me, sometimes with Riley, and on a couple glorious occasions, with Riley and one of the many other girls she befriended during the week. Last year, when Ryan showed early signs of boredom at the beach, we came up with a game, wave hockey, to occupy the time. This year, we came up with a new game. It involved throwing a football back and forth on the beach, but the game was not football. Oh no, it was a form of hockey. 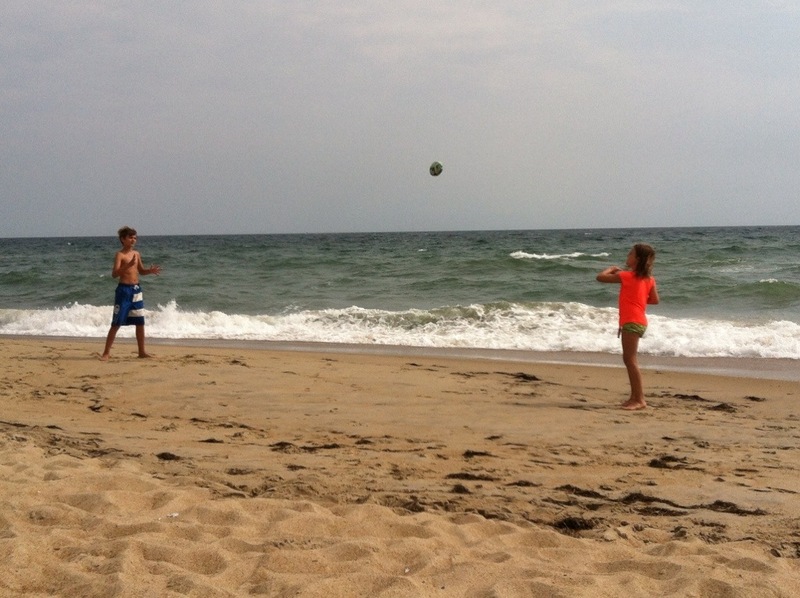 I’m sure many passersby thought it was odd that my son and I were trying to throw a football past one another on the beach while talking about shots, saves, and goals, but I didn’t care. My son was happy, he was engaged, and he was not asking to leave. Riley even got in on the act one time. At the pool, it was a similar story. We used a volleyball to play a form of hockey, trying to throw the ball past one another for “goals.” Recalling our time watching the Olympics, I told Ryan what we were actually playing was not hockey, but water polo. 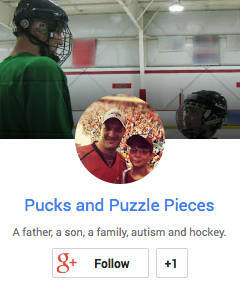 It was a risk; I thought he might reject playing the game if it wasn’t associated with hockey. But he just shrugged and said, “I know,” and the game was water polo from then on. I should note that these games were not without their Ryan touches. He calculated shooting percentages on the fly — saves divided by shots against and expressed as a three-digit decimal. At one point I had to stop and ask him how he was doing the math. I am always curious to learn how his brain works. Was he doing the calculations in his head? It turns out he wasn’t, at least not all the time. He has spent so much time looking at NHL box scores, that he memorized (big surprise) the save percentage of certain shot and save totals. If you’ve scored one goal on 13 shots for example, he knows without calculating that your save percentage is .923. Finding ways to engage with Ryan was wonderful, but the real treat came on those occasions when he played with Riley and her friends. Riley is like a cruise director. She looks out at the crowd of kids at the pool or beach, finds girls about her age, and goes right up to them and introduces herself. By the end of the week, she had made several good friends. Ryan is very much in the midst of a “girls are stupid” phase. He’ll willingly play with his sister (I’m not sure if it’s because she’s a blood relative or because she likes hockey) but that’s about it. And yet, at one point I looked up and a game of “monkey in the middle” had broken out with Ryan, Riley and one of her friends. It went on for an hour. When it was over, Ryan told his sister that her friend was all right — high praise given the circumstances. Other times, Ryan willingly played “Marco Polo” with a large group of kids in the pool. Still, I’ll take it. As I said, the trip had plenty of ups and downs. There was some explosive anger. But it was definitely easier than last year. During this one week, we spend more time together as a family than any other week of the year. Doing so hasn’t always felt like a vacation, but this one definitely did. Love this. Glad it was a great vacation!